Chicco is delighted to see us when we meet him on a crisp morning in the Italian countryside of Emilia-Romagna. He springs up on to his hind legs to plant a slobbery kiss on his owner’s nose, then greets us by wagging his tail gleefully. We’re in the woodlands surrounding Sant’Agata Feltria, a sleepy, fairytale village that comes alive during weekends in October when 10,000 tourists descend for its truffle festival. This morning, we’re joining Chicco the spaniel and his owner Sauro to track down some truffles. As shafts of sunlight slice through a canopy of oak trees, we follow Chicco through the woods. Suddenly, he sniffs the ground intently, scratching his front legs into the mud and sending soil flying. Sauro uses a special trowel-like tool called a vanghetto to dig deeper, then plucks a black lump from the soil, giving it a rub before holding it like a prize in his palm. “It’s been a tough season for truffles this year because of the lack of rain,” Sauro smiles. It makes our discovery feel even more special. The white truffle is famously more elusive than the black truffle we’ve just found, growing mainly in Italy’s Piedmont, Le Marche and Tuscany areas, as well as here in Sant’Agata. “Black truffles grow up to 10 centimetres underground, while white truffles can be hidden up to one metre below the earth,” explains Sauro. Little is known about how or why the white truffle grows. It also has a much stronger scent and flavor compared with the black truffle, making it more expensive. “Put a white truffle next to a closed egg, or in rice, and it’ll soak up the scent and flavour,” Sauro says. He is a pizzaiolo (pizza maker) by trade, but truffle hunting is his passion. He explains that the history of the truffle dates back to antiquity, when it was said to have aphrodisiac qualities. 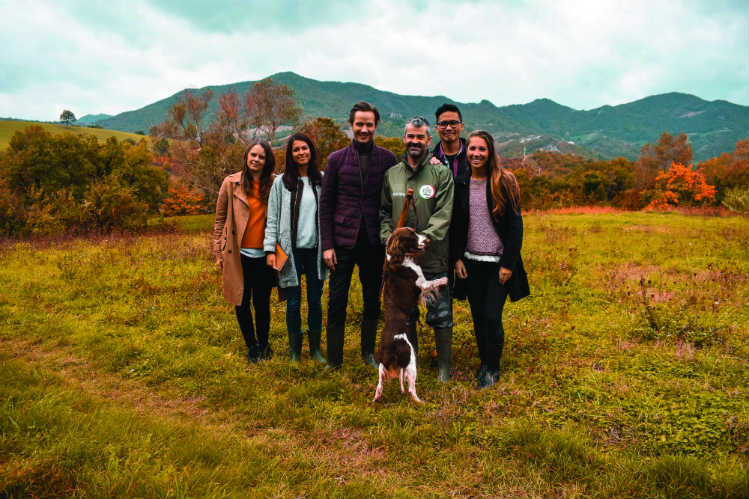 Now truffle hunting is big business – depending on the season, local black truffles can retail at between €600 and €1,400 a kilo, while white truffles sell for between €1,500 and €2,500 per kilo. Back in the village after three more truffle finds, we mooch at market stalls filled with truffle-infused oil, salami and sauces, as well as local delicacies including spianata (Emilia Romagna’s version of focaccia) and its famous sangiovese wine. At Sauro’s joint, he takes a fresh pizza from the oven, adding a generous layer of grated black flakes. The flavour is subtle, earthy and delicious, proving why the truffle has earned iconic status. Truffles are just the beginning in the fertile plains of Emilia Romagna: the region is famed worldwide for its legendary local produce. Parma ham, Parmigiano-Reggiano, balsamic vinegar – they’re all born here. The region is less popular with food-loving Brits compared with Tuscany, making it an appealing choice for the crowd-averse. 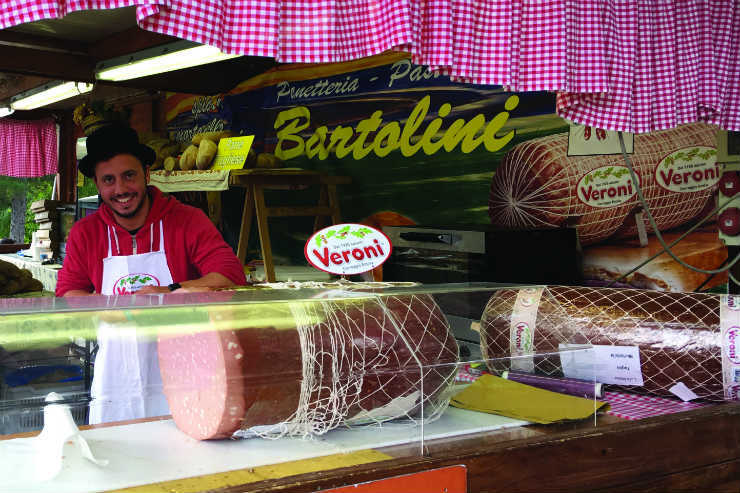 My foodie trail visits the beautiful, culture-rich towns of Ferrara, Ravenna and Rimini. “You must be rough at first, then more gentle,” declares Marina, our buxom, red lipstick-wearing chef, gesticulating at the dough she’s made. We’re learning how to make pasta at Collina dei Poeti, an idyllic hotel surrounded by its own vineyards and olive groves, near the village of Santarcangelo di Romagna. Marina wields her rolling pin, winking sassily: “This is the Romagnola woman’s Excalibur. Now, copy me.” She kneads and stretches the yellow dough with her hands, swaying her hips as she works. She works the dough into a ball then flattens it with her rolling pin, rotating it by a quarter of a turn each time. “It needs to be thin enough that you can see the shadow of your hand behind it,” she demonstrates. We do the same, then sprinkle on some flour and fold the dough over itself to make a long thin sausage, which we cut into roughly centimetre-thick strips. We unfurl the strips to reveal golden ribbons of homemade tagliatelle. Next we’re taught to make cassoni, small half moon-shaped parcels of dough filled with spinach and cooked on a terracotta plate. Dinner is laid out like a banquet before us. An antipasto of local mortadella, Parma ham, salami and cheeses, served alongside our crispy bite-size cassoni and fried olives stuffed with mince, all washed down with warming sangiovese wine made from the hotel’s vineyards. Our tagliatelle has been transformed by a silky, tomato-sweet ragu that transports me back to childhood and sitting at my own Nonna’s table. (Spaghetti Bolognese doesn’t exist – the very mention of it gets Italians riled up. Tagliatelle al ragu is the authentic version of the dish). Dessert is a plate piled high with ciambella, a simple vanilla cake, and crostata, a tart filled with jam and dusted with icing sugar. Passion for food is innate here: we see it in the snaking queue for the bakery at Sant’Agata, in the proud grin of the gelataio (ice cream man) in Santarcangelo when I tell him his pistachio ice cream is the best I’ve tasted, and in the reverential respect for culinary traditions from every Italian we meet. In the Renaissance city of Ferrara, we visit the world’s oldest osteria dating back to 1435, where university students sit pouring wine from dust-coated bottles. During dinner at a deli-style restaurant, our guide Silvia talks us through the local dishes that arrive at our table, starting with coppia, an intricate, twisted bread shaped like an intertwined cross. “Coppia means couple, referencing the Renaissance period when aesthetics was celebrated,” explains Silvia as I take a bite. Ferrara’s tradition of teaming two contrasting flavours is also alive and well: local pasta capellacci is filled with sweet pumpkin and nutmeg and dusted in salty parmesan, while my pasticcio di macaroni is a comforting ragu and truffle pasta topped with a dessert-like piecrust. Mess with tradition in this region and you’ll know about it. “Cappuccino is only drunk before 11am, and espresso should never be drunk with sugar,” tuts one of our guides when someone gets it wrong. “Don’t be too precise,” chastises Marina during our cookery class when we slice our tagliatelle too prudently. “It’s meant to be imperfect – that’s how you can tell it’s homemade,” she smiles. 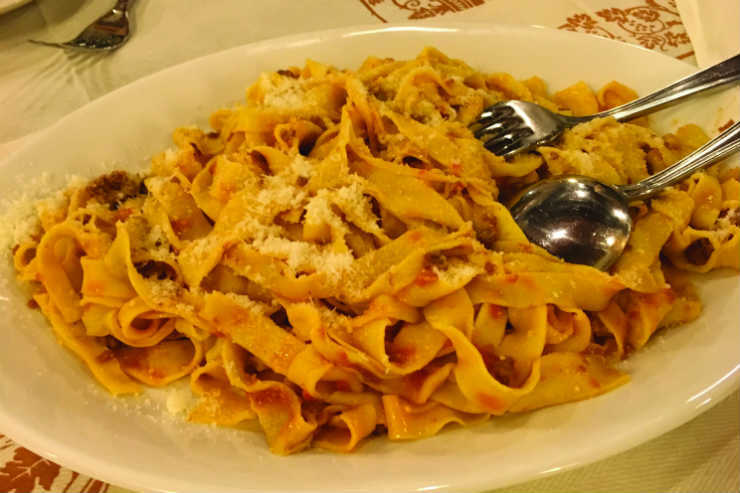 It’s this rough-and-ready attitude towards cooking and eating that embodies the foodie spirit of Emilia Romagna: simple, fuss-free, and fiercely proud of its own identity. Located outside Bologna, Fico Eataley World is a new indoor “agri-food park” offering dining at more than 40 restaurants, from street food stands to Michelin-starred eateries. Aside from eating, customers can take cookery classes and visit the conference centre for food-related talks. The park also has an on-site farm, interactive exhibitions and 40 food “factories”, where clients can see how some of Italy’s most reputable brands make their products.